Why some Artists' Oils cost more than others. If you've ever purchased and painted with some of the most expensive oil paints on the market, you probably already know that you're getting value for money. If not, you're probably wondering why some professional oil paints range from $12 to $60 and others, $20 to $145. Manufacturers who produce higher end oil paints choose higher priced pigments with a higher ratio of pigments per tube. They use quality binders and the ratio of binder to pigment is less than other artist colours. They also stay away from fillers which are basically used to save money. 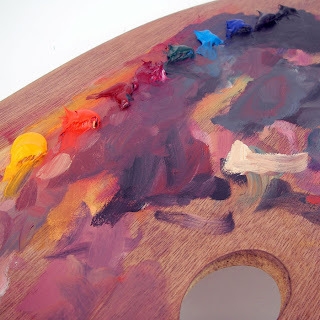 Oil paints are different than acrylics in that there isn't a need for a high quantity of extenders and binders. Without a lot of binder, acrylics would just get rubbery in the tube. The same goes for Alkyd-based oils and for this reason, alkyds have a lower price tag even for the cadmium colours. All high quality paints should meet the following criteria. 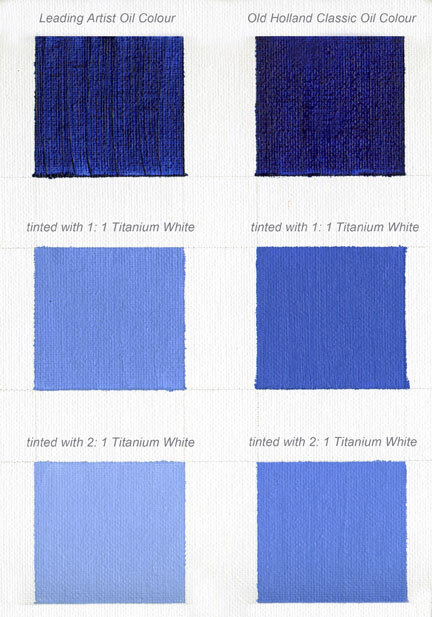 They should have good covering power, good strength of colour, remain completely lightfast (beware of any brand that claims their Alizarin Crimson is lightfast), and have maximum colour intensity. Old Holland guarantees that there are no extenders in their traditional, classic pigments and that all their pigments conform the ASTM ratings of categories I and II. Below, we created a tint chart using Old Holland (our best quality and most expensive oil range) and another leading brand of artist oil colour. We laid down a solid mass tone of Cobalt Blue PB28 then, we took 1/4 teaspoon of the same Cobalt Blue and mixed it with an equal portion of white (1/4 tsp). Then we took that mixture, and mixed it with another 1/4 teaspoon of white. As you can see, the Old Holland tint on the right, is much, much stronger than the other leading brand of oil. Proving that Old Holland is giving you more of this high cost pigment in every tube.